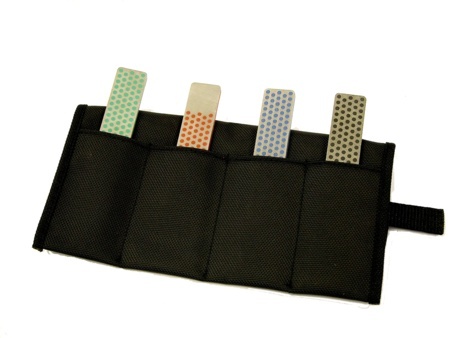 Convenient 4” pocket models make sharpening a breeze. This kit of Diamond Whetstone™ and Machinist sharpeners includes a convenient black fabric tool roll for quick and easy access. Each stone measures 4-1/3” x 7/8” x 3/16”. 4" Extra-Coarse Diamond Whetstone (60 micron / 220) when significant removal of material is needed for a damaged edge. 4" Coarse Diamond Whetsone (45 micron / 325) to quickly restore a neglected edge. 4" Extra-Fine Diamond Whetstone (9 micron / 1200 mesh) to polish and refine a razor edge after sharpening with a coarser diamond. 4" Fine Machinist Diamond Whetstone (25 micron / 600 mesh) for a razor sharp edge.